Good morning…I thought today with somewhat quiet weather for the next 48 hours or so we’d dive into something that I found to be somewhat surprising to me when I found out about it. It was a series of maps that I saw and wanted to show you…indicating how long parts of counties in the region have gone without being under a tornado warning. With that subject in mind I’m going to go over a few other things with this being the 1st day of April and the VERY unofficial start to severe weather season in the KC area. Today: Mostly sunny and milder with highs well into the 50s to near 60° for some. The line that we give you during weather sometimes is that severe weather can strike anytime during the year…January…or December and every month in between. This is very true. I’ve seen severe weather events in the winter…and of course in the summer as well. 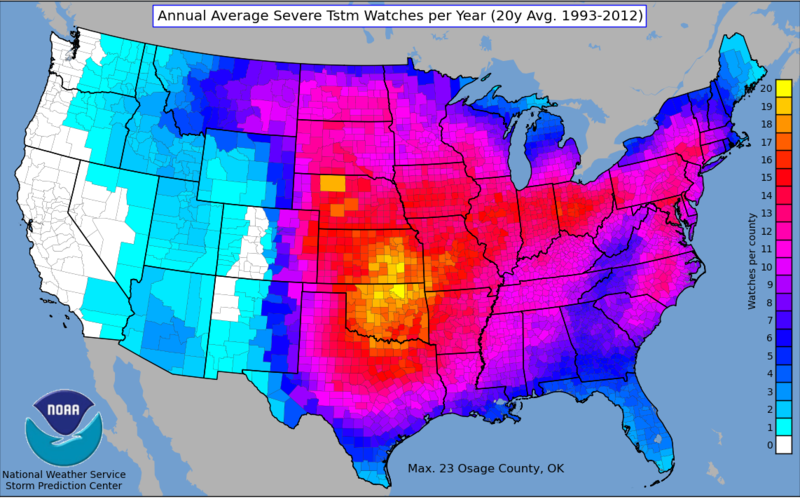 For the Plains though the most active time for severe weather is typically April/May/June. Although, while I don’t have any concrete evidence for this…it seems that June is getting more active that what you would typically think from the past while April is getting less active. March is sort of a wild card month while July typically sees a reduction of severe weather. 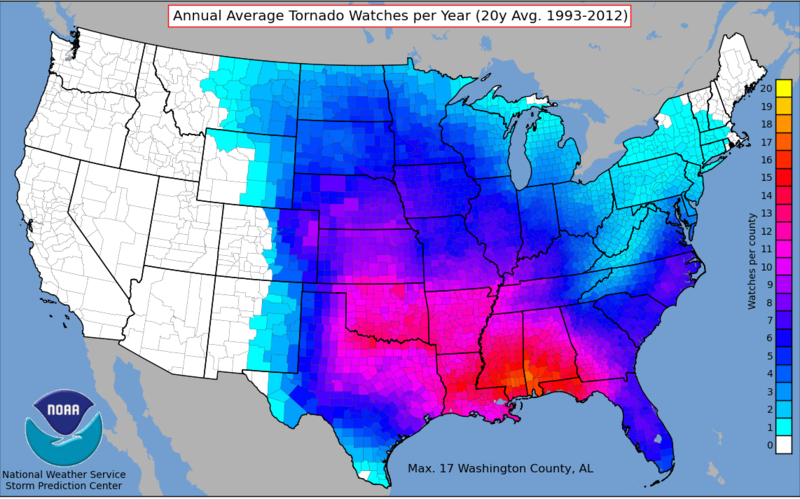 Tornado season…and again while a tornado can occur any day or any month of the year…is mostly in the Spring. This is because ingredients to create tornadoes in the Plains are at their highest. Wind shear, both from a speed standpoint (winds increase with height) and from a directional standpoint (winds turn clockwise with height) are typically maximized during the Spring to early summer months. There are still waves that come through the Plains states with some vigor, as opposed to the more innocuous features of the summer. This all helps with the creation of thunderstorms…and that is step one to getting a tornado. The dry line, which is a feature that sets up in the SW Plains…think OK/TX also is more vigorous as well. This dry line separates dry desert heat with warm moist gulf air. We see that in the dew points especially…often seeing a change from 70+° dew points (a lot of surface moisture) and teen dew points (very dry air west of the dry line). There are other things that go into all this of course…but those are at least some building blocks to thunderstorm formation. When the risk of severe weather grows in the course of a day…the Storm Predication Center (the SPC) based out of Norman, OK will issue a WATCH of some sort. This could be a Severe Thunderstorm Watch or a Tornado Watch. When the maps show a severe thunderstorm watch…they will be shaded in BLUE…and this means that the conditions in the atmosphere are becoming conducive for the creation of severe thunderstorms which would include the potential of hail…high winds…and perhaps even a tornado or two. When the SPC issues a tornado watch…this is about the same except that there is a higher likelihood of tornadoes in addition to the other threats mentioned above (hail/wind). During the course of a year this area will be placed under about 10-20 different severe thunderstorm watches…maybe more IF you talk about parts of the area. We haven’t had it so bad over the past few years…although I can’t find any updated maps about those watches…I know their out there somewhere. Last year was a low year for the watches…(no complaints) at least for our area. So with all that said…let’s just say that your county is under a WATCH of some sort…whether it be a tornado or severe thunderstorm WATCH. A suspicious cell via radar forms…and spotters report the cell is developing a wall cloud and trying to develop a tornado. A WARNING is issued for a part of a county or counties depending on the track of the cell in question. When a WARNING is issued we want to have you take some action…and that’s when we want you, in this case to get into your “safe” place. Whether it be a downstairs location…bathroom…whatever. Odds are you won’t be there for that long…but WE WANT YOU there! Now for many areas, and this gets to the title of the blog, tornado warnings are somewhat unusual (at least around the KC area) but IF you remember last May…the night before School Day…we had a pretty significant number of the folks within the KC Metro area under a Tornado WARNING for at least some point of the night. Here is a look at that night…just to show what CAN happen..even here. These are just the tornado warnings! A LOT of the region had a warning that night…and a lot of you were so good in getting to your safe spot that evening. That night I think there were 5 tornadoes (EF0-1) inside the KC Metro area. We were VERY lucky nothing worse happened that evening in terms of damage inside of the Metro at least. With that said there are parts of the region that HAVEN”T been under a tornado WARNING in more than 10-15 years. When the warnings are issued, especially tornado warnings…typically only slices of a county or counties are under a warning. Sometimes, depending on the county the sirens can be sectorized…sometimes depending on the county…they can not be. This means that IF the county is 30 miles north to south…and the risk of a tornado is down towards the southern part of the county…the northern part of the county triggers their sirens as well. Not the greatest but that’s another blog. I saw some maps the other day that showed how some areas in the region have not been technically under a tornado WARNING in years. Closest to KC look towards Linn County…2 counties south of JOCO. Also look at far southern Atchison Co…a couple of counties north of Wyandotte. The areas in the darkest blue colors. That goes back to at least 2005. The map above takes into account the “polygon” shape of most warnings. Also note the SW to NE trend in the creation of said polygons. Hello Bates Co…hello SE Buchanan Co…hello Chariton Co…parts of JOCO on the MO side as well. See those areas of blue? Again many years have gone by without a tornado warning for those sections of counties. Again note the SW to NE bias of warning polygons. and IA…not so much in southern IA…but more predominate in N IA. All this is fascinating to me…and also reflective too. 1) know which county you live in…2) just because you haven’t been in a WARNING in years doesn’t mean you can’t be triggered into one 3) there are NO funny quips about this or that preventing our part of the county to be under a warning (sorry “Tonganoxie Split” folks ;) ) In time it will…maybe this is the year…hopefully not! It’s basically a reminder to have a plan…think about it on a week like this week when no significant severe risk is there through Friday at least. The time will at some point come…whether it’s this year or next…or the year afterwards. Don’t be caught blindsided by the risk all of a sudden.